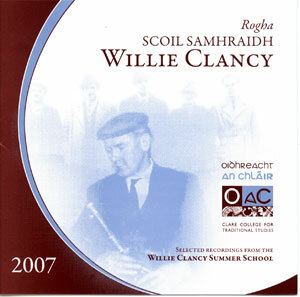 Selected recordings from the Willlie Clancy Summer School 2007. 3. Séamus O’Rócháin, Bríd O’Donohue:- The Virginia Reel, The Concert Reel. 4. Tommy Peoples:- The Donegal Reel, Black Pats, Pat McHughes (Reels). 3. McPeake School:- The Rolling Wave, Jigs before Reels, Slieve Russell (Jigs). These CDs are published by OIDHREACHT AN CHLÁIR (OaC) with the cooperation of Scoil Samhradh Willie Clancy and with the permission of the artists. All of the tracks on the CDs were recorded live at the Main Concert of the Willie Clancy Summer School, on 14th July, 2007. The recording was made for archive purposes and the sound was mixed, on the night, for the benefit of the audience present, publication was not envisaged at the time of recording. For technical reasons it has not been possible to include all the performances on the night. The performers on these CDs are amongst world’s finest exponents of the traditional arts. OaC would like to thank them for their generosity, without which the CDs could not have been produced. Tunes are identified where possible. However, alternative titles may also apply. Published by Oidhreacht an Chláir Teo. - May 2008.